There’s something about the historical epic that allows movie fans to forgive them being incredibly long. “Gandhi” was three hours, eleven minutes long. “Lawrence of Arabia” clocked in at a bladder-busting three-and-a-half hours. “Gone With the Wind” is four years long, approximately as long as the actual Civil War was (at least it feels that way to me). Add to the list of long historical epics Warren Beatty’s 1981 film, “Reds,” the story of socialist agitator John Reid. “Reds” checks in at a respectable three-and-a-quarter hours, and not one minute is wasted. 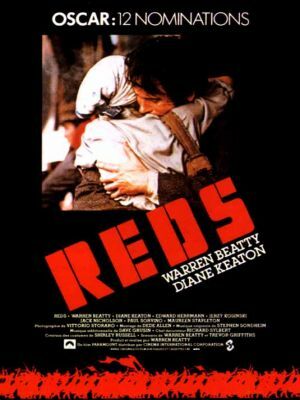 “Reds” tells the true story of John Reid (Beatty), a socialist union activist, and his wife, Louise Bryant (Diane Keaton). Reid is a journalist of some renown, and Ms. Bryant asks him to read some of her writing and give her a reaction. What starts off with Reid reluctantly agreeing ends with him in a caffeine-fueled screed on labor relations, World War One, the rise of Socialism, and how the rich control everything. Louise Bryant leaves her husband and follows Reid. Soon, she’s immersed in an intelligentsia including Reid’s friend, playwright Eugene O’Neill (Jack Nicholson). Over the years, Reid and Bryant share a life as turbulent as world events. They always seem to be leaving one another—half the time, in a state of pique—but there’s always an eventual reunion. Truly this couple was meant to be together. Truly, also, these two bright, opinionated, concerned people were meant to be together during that powder-keg era. As the film progresses, things grow increasingly complicated. Reid and Bryant travel to wartime Europe and pre-Communist Russia on a number of occasions—sometimes as a couple, some not. Reid becomes involved in Russian politics, and when Reid doesn’t come home when he’s supposed to—and she can’t find any word of him—Bryant endures an arduous journey to find him. I won’t describe all the action, or the review would take as long to read as the film does to watch. When I referred to the film above as being Warren Beatty’s, I did so advisedly. Beatty produced, directed, co-wrote, and stars in the film, and does an excellent job in each. This was not an easy film to direct—he had to make scenes of just conversation seem interesting, then five minutes later, have armies marching and things exploding. As co-screenwriter, he had to make a historical political movement sound interesting—it would have been very easy to lose the audience. As the star, Beatty doesn’t just saunter and wink and get by on his good looks; his portrayal of John Reid is passionate, and he generates amazing chemistry with Diane Keaton. As producer, Beatty had to juggle multiple locations across the world, and find the right cast. And the cast is top-shelf, with Oscar-winners like Keaton, of course, Jack Nicholson, and Gene Hackman. Alongside the stars are some of filmdom’s best character actors, like Edward Hermann, Paul Sorvino, M. Emmett Walsh, and Maureen Stapleton, who won the Best Supporting Actress Oscar for her role as Emma Goldman. “Reds” was nominated for twelve Oscars, including the four acting categories (Beatty, Keaton, Nicholson, and Stapleton). Appropriately, Warren Beatty won the Oscar for Best Director. This film is highly underappreciated, and I don’t understand why. How the overwrought, oft-parodied “Chariots of Fire” beat out the sweeping, complex “Reds” for Best Picture eludes me. All I can think of is that Oscar voters were ensorcelled by that damned Vangelis theme song. This entry was posted in Academy Award Nominees, Academy Award Winners, Based on a True Story, Films, Period Picture ("Costume Drama"). Bookmark the permalink.